I have a confession to make. Sometimes, I like Talisman more than D&D. Blasphemy, I know, but sometimes I’m just not in the mood for full on RPG. Which brings me to my catch-all description for Talisman: D&D Light. 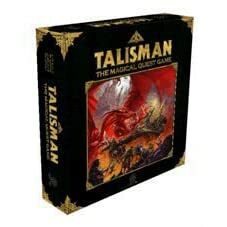 The basics of the game are this: You pick a premade character to play (Warrior, Priest, Wizard, etc) and begin questing for a mystical Talisman. This artifact will allow you to battle for the Crown of Command. Along the way you’ll fight monsters, demons, undead, and even the other players. Heck, you might even get turned into a toad! So why play this instead of D&D (or other RPG)? There’s no need for a DM (everyone plays). There’s no planning, no setup, no story. Just hack and slash and spells with your friends. We used to play it mostly when several players were missing from our usual game session. The game was popular about 20-odd years ago, but old sets went for $200 on eBay. Gamers Workshop created a limited edition set about 8 years ago. Now, the rights have been sold off and now Black Industries is making the games (for a reasonable $30).